It has been a whirlwind since November – isn’t that the way it is for everyone? 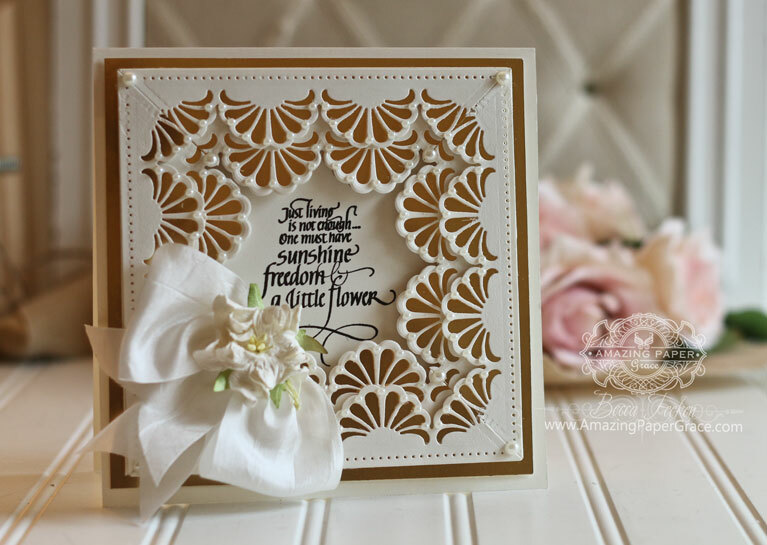 Today I’m sharing a card made with the Graceful Frame Maker and one of my new borders. I’ve received lots of question and this is the best place to share some updates for people who are looking for these dies. Currently, the collections are available at Create and Craft USA and Create and Craft UK – some of the dies are sold out but pop over to the respective sites and you’ll be able to see what’s still available. If you want to get your hands on to these sets, Create and Craft has the best current availability. The dies will be shown at CHA in January so definitely encourage your local store to pick them up; they should be available in the Spellbinders Online Store in March 2017 and if you were unable to get the Graceful Frame Maker in the US or see any of the others that have sold out, you can put them on your wishlist in the Spellbinders store right now. My card today has been on my workbench waiting for a bow for several weeks – I was playing around and decided to layer two mitered borders onto one card using Spellbinders Graceful Fans Border and it was cut using the Spellbinders Graceful 6 x 6 Frame Maker. The way the dies are configured, it’s easy to cut the four borders where each fan center is cut then follow up by cutting the outline shape to put behind the fans for a punch of color. I’m using a lovely Quietfire Design sentiment (Just Living Is Not Enough) that works wonderfully in a square frame! For new readers, every Friday it’s my pleasure to give away a card. The card goes to a randomly picked reader (worldwide) who leaves a comment in our conversation. Want to know more about Day of Giving, here’s a link to my FAQ’s just check out #11. You can check to see if your name is on the list of winners HERE! For your comment: What’s one thing you want to ditch and one thing you want to pick up in 2017? Missed u last week but glad I got to spend with family. Beautiful arc today. Hope I start the year with winning it. I want to ditch negative draining friendships and pick up some new friendships. I would like to ditch all the clutter in my house! I wish I was like I used to be before I hit my head!!! Wishing you and yours a Very Happy New Year!!! I would like to ditch my habit of procrastination! And I would like to pick up a more timely habit of getting things accomplished! Absolutely stunning, nothing beats a white card with gold, simply exquisite! Oh Becca what a wonderful day you must have had with all your offspring together – it does a mother’s soul good to have that happen. Love your exquisite card so beautifully executed!! I would love to ditch some excess weight in 2017, and the cancer that is invading my family, near and far! 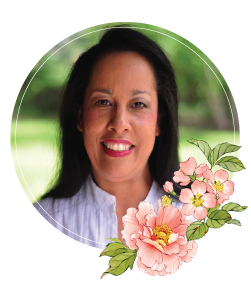 What to pick up – grace and strength in the Lord. How delightful that you got to be with all three of your children during the holiday season. What a blessing. Thanks for taking the time to share this lovely card. It is gorgeous, and I can’t wait to get my hands on these new designs. Happy New Year Becca! Hope it’s a good one for you! Love how your card has turned out with those two layered frames. Makes it extra special Thank you for your continued inspiration. Happy New Year, Becca! What a wonderful blessing that you could see your children for Christmas. So glad for you. Stunning card Becca! Love that Die!! Sounds like you are having a wonderful holiday season!! Glad to hear it! How wonderful to have your family together! I have a surprise from my brother and sister-in-law. I am letting go of disappointments with people and prioritizing things that bring me joy and feed my soul. I am having so much fun playing with the new Graceful Borders dies and the Graceful Frame Maker. I had to smack myself on the forehead today when I saw your gorgeous card as I would never have thought of layering two ‘fancy’ border frames. It makes for such a lacy look. Such an entriguing card to make as it looks complicated. It Is just gorgeous! Beautiful card. I bought the set of borders and am so anxious to try them all out especially the frame maker. I love the double boarder on this card. I’m still trying to get on your mailing list again but I am not having any luck. I have to keep going to one of the old post to get to the newest one. I don’t want to miss a single post on the new boarders. pop in to share your card it is perfect right down to the sentiment . us and what a special bow WOW !!!!! to you and yours . 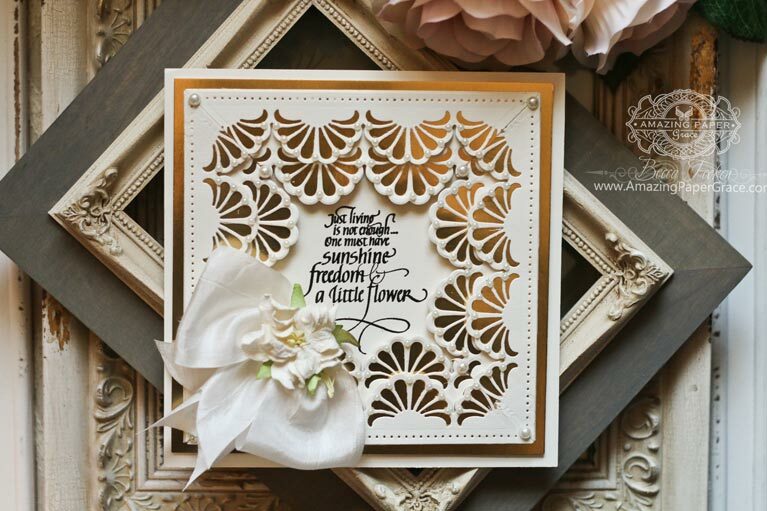 Beautiful layers and textures on this gorgeous card! Something I want to ditch…. my tendency to hoard things! Would like to ditch crafting items I am not using so someone can give them new life – actually am doing that as I have sold the house and moving into an Independent Living Continuing Care area in a one-bedroom apartment – so lots of downsizing!!! I wish to be very cautious in what I add to my crafting in 2017…will have to knock me off my feet – LOL! Received in 2016. I want to pick up my Dreams in 2017. Oh Becca what a beautiful card i just love it !!! Happy New Year to you, Becca and all those who read this post. I trust 2017 will bring much love and blessing to all. What a beautiful card. I love the gold and white and also the sentiment. Life without flowers (or nature) would be so dull. In 2017 I really, really want to ditch the house I’m living in. I so want, need and look forward to picking up my bungalow – the retirement home I’ve should have moved to last year. Third choice and hoping that the old adage ‘third time lucky’ will apply – even though I don’t believe in luck. I want to ditch the fear of jumping into starting my own little venture of selling my cards. I would like to pick up the joy that I’m feeling helping my daughter organise her wedding in August 2017, and really enjoy doing her Wedding Stationery. Hi Becca ,beautiful card and verse . I want to ditch my weight and pick a good diet to help me to do it lol. May i just wish you and yours a very happy ,healthy New Year. I want to ditch my health problems and pick up some good health. Hi Becca so glad that you were able to spend spend? time with your family over Christmas as I think it is the one time we should spend wiith our loved ones. Your card is as always beautiful and your new dies are on my wish list so hopefully they will find a loving home here shortly. Would just like to wish you and your family a Happy, healthy and peaceful New Year. 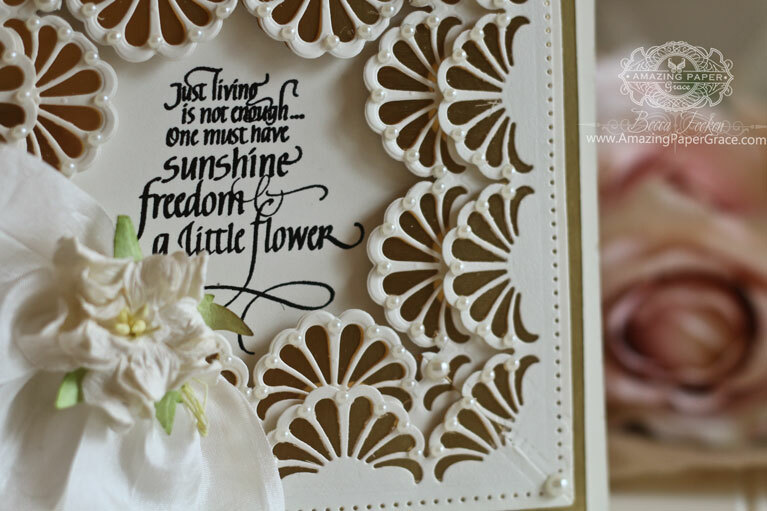 Beautiful card made with wonderful dies. I want to ditch old age and pick up my wrinkles!!!! The one thing i most want to lose is weight and the one thing i want to pick up in 2017 is courage. Just love the card and your new borders Becca cant wait for when they appear in my favourite craft shops. This card is really beautiful Becca, so glad you were able to spend a few days with most of the kiddos, when they get older it is hard to all match up schedules but when you do, it is so much fun and love. Gorgeous card! it would make a stunning wedding card for someone. I would really love to see a video on the Graceful Frame Maker and how you put together this card. My mind can’t wrap around how to make the frame, even after looking at the die on the Spellbinders website. Hi Becca, A stunning card !! I am so pleased that you got to see all your children this Christmas holiday, such a blessing. I would like to ‘stop moaning about things that can’t be helped. and in 2017 I would like to ‘be a much better person’. Happy New Year to All, and I hope that 2017 is kind to you. Gorgeous card! Love everything about it, from the gorgeous scalloped mattered coreners to all the pearls. What an amazing trip you and the girls made! I love these unplanned exploits – they often turn out to be the best! How lovely for you all to be together at Christmas like that! Love the card and the way you have transformed the borders with your genius die! Beautiful card, I was just thinking what a special gift this card would be and then noticed you give them away. How sweet! Your new card is exquisite – I love your extra little touches to each die – you have a unique way of presenting them. Thank you for all the time and effort you put into your work – I know appreciation is one of my motivators and definitely inspire me onward! I wish the same for you in 2017 – Have a great new year! Hard to believe it’s been a whole year since I’ve been here! lol! This card is so lovely! Watch less, DO more is my motto for this year. I have so many bookmarked projects (like this one!) I hope to actually DO some of them!! Hello dear Becca! This new die frame creator die set is a must have! While it’s on preorder I want to try out the technique manually for non-square cards, but oh will that beautiful set be part of my collection! I’m stopping by as part of my anual tradition of visiting your virtual home to say Happy New Year! Also, to thank you for all the inspiration, ideas, tips, products, generosity and love you don’t mind to share with us throughout the year. My wish for you is that you keep winning in all you do :D More new beautiful releases, more time to create, blessings, love and health. A 2 size? In our area that is the popular size. Very few 6×6. I hope they can do it. I bet it would be very popular. I feel like my entire home needs a major reorganization and deep cleaning. I’ve been in a wheelchair for 2 years now so there are many things around the house that are difficult or not possible for me to do. Fifteen months ago, my husband developed a very serious heart problem which resulted in a specialized open heart surgery that required we travel out of state for. As a result, my wonderful hubby hasn’t been able to do the house hold duties he would normally do. I feel as if we are behind in everything and it really bothers me. I am praying for a much improved 2017 where we catch up.